Hi Guys, Lynn here back with another recipe. 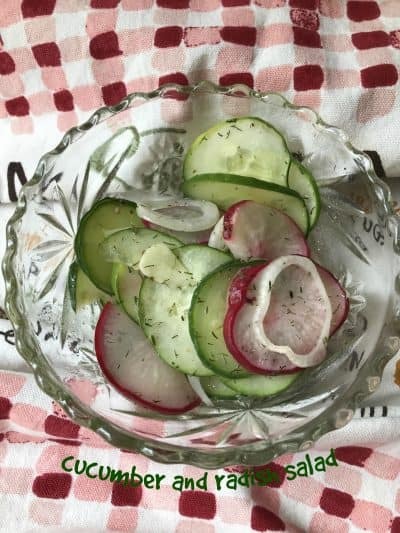 If your looking for a great recipe to enjoy this Labor Day weekend, Cucumber Radish Salad is the answer. 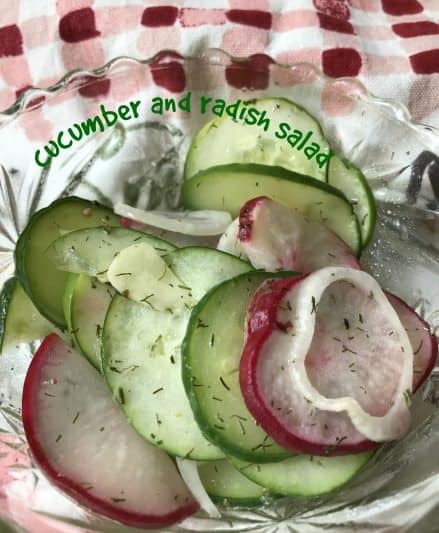 Cool cucumber, peppery radish and sliced onions are tossed together oil/vinegar/sugar. 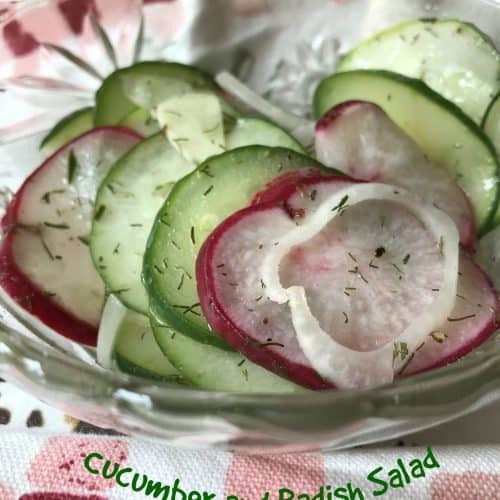 This simple and easy salad is the perfect salad to make this time of year when cucumbers and radishes are in season. The dressing for this salad is an oil based dressing. Made with olive oil, white wine vinegar and little bit it of sugar. For this salad we used Vidalia onions, but you can use red, white or yellow onions. The dressing can also be made with dried dill weed, if fresh isn’t available. 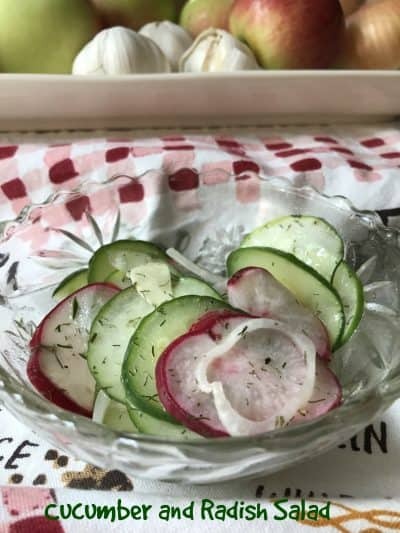 For this salad, you want the cucumber, radish, onion and garlic sliced paper thin. The easiest way to achieve this is by using a mandoline. Mandoline [MAHN-duh-lihn; mahn-duh-LEEN] A compact, hand-operated machine with various adjustable blades for thin to thick slicing and for Julienne and French-Fry cutting. Mandolines have folding legs, and come in both wood or stainless steel-frame models. Mandoline come in plastic type models. Mandolines come in all price ranges. They’re used to cut firm vegetables and fruits (potatoes or apples) with uniformity and precision. Hailing as its name implies, from the Hawaiian island of the same name, is sweet, mild and crisply moist. It can range in color from white to pale yellow and is usually shaped like a slightly flattened sphere. The Maui onion’s season is from April to July. Are the namesake of Vidalia, Georgia, where they thrive. At their best, these large, pale yellow onions are exceedingly sweet and juicy. They’re usually available much of the year in the regions where grown and from May through July elsewhere. Walla Walla onions are from Washington State, named after the city of the same name. Large, round and golden, they’re in season from June to September but are often available outside their growing area by mail order or specialty produce markets. Hail from South America and as their name suggests, are extremely succulent and sweet. In fact, Oso Sweet Onions contain almost 50 percent more sugar than Vidalias. They’re available in specialty produce markets from January through March. 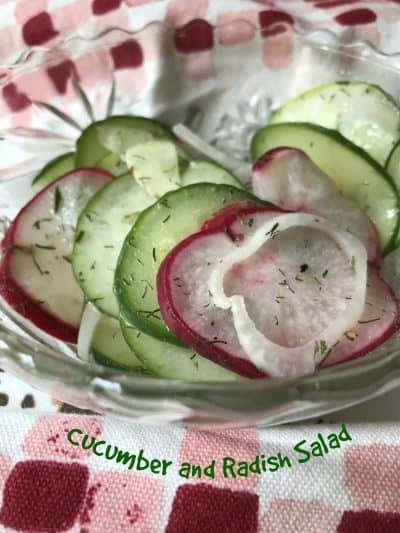 Cool Cucumber and Radish Salad is a great side dish to serve alongside grilled meats. Perfect to serve at picnics and barbecues. Toss radishes with salt; let stand for about 10 minutes. Drain any liquid and transfer radishes to a large bowl. Add onion and cucumber slices. For this recipe we used Pompeian White Wine Vinegar. German Cucumber Salad and Broccoli, Cauliflower, Bacon Salad are two favorites to serve at picnics. Use garden fresh vegetables to make this salad extra special. Fresh vegetables taste so much better than store bought and can take any so so salad and make it a super special salad.